This beautiful white gold ring makes a sophisticated statement. 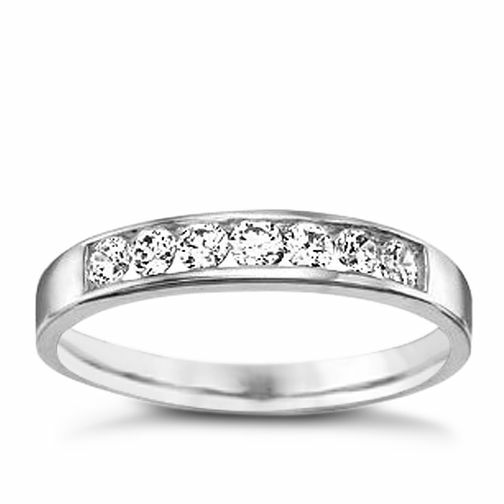 It is in a classic shape and features seven cubic zirconia set in a polished white gold band. 9ct White Gold Cubic Zirconia Ring is rated 4.3 out of 5 by 7. Rated 5 out of 5 by Anonymous from Beautiful ring Beautiful ring. Very delicate and lovely sparkle off it. Highly recommend for the price. Rated 5 out of 5 by Anonymous from Gorgeous ring Bought this as my wedding ring as our budget had reached max. It’s a beautiful ring and sits lovely next to my engagement ring. Can’t wait to actually wear it in January when we get married.